The FCBEscola soccer schools in the Middle East, located in Riyadh (Saudi Arabia) and Dubai (United Arab Emirates), performed brilliantly at the recent U11 Bahrain International Championship Academies, with the former winning the ‘best team’ award and the latter coming third. Albert Medall, the local project director (DPL) in Dubai said afterwards that “I’m very pleased with the development, satisfaction and image of the schools in this competition”. The Emirates team reached the semi-finals by beating the academies of Inter Milan (1-0), Juventus (3-2) and TFA (4-0) and losing to Tekkers (0-3). 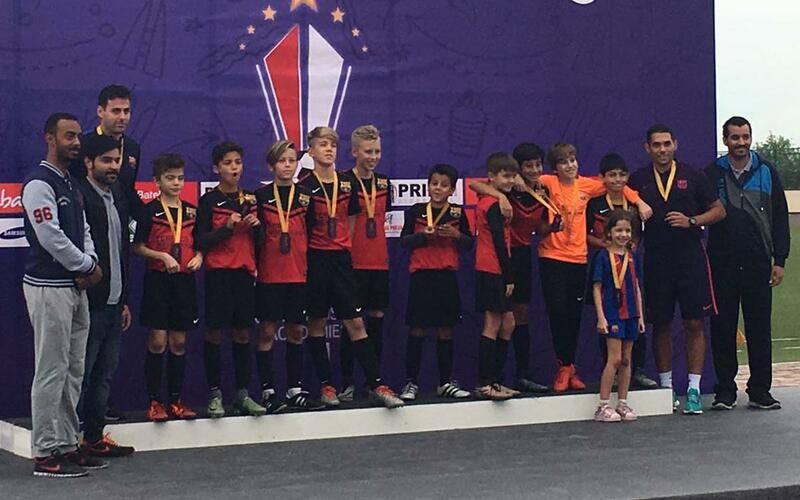 They lost the semi on penalties after a 0-0 draw with the RCD Espanyol academy in Dubai, and then won the bronze medal match against Academia Winners Bahrain on penalties, with some great saves from keeper Christopher Robinson and Arthur Schultz winning the tournament MVP award. FCBEscola Riyadh, "Best Team in the Tournament"
FCBEscola Saudi Arabia was named best team in recognition of their good football, organisation and the attitude of the players both on and off the field. They went out in the group stages after beating Arsenal (1-0) and Super Academy (2-0) but losing 1-0 to both Espanyol and the Winners. Riyadh DPL Josep Cifré commented that “I am very happy with our work at this tournament. We have displayed the Barça identity on the field and the FC Barcelona both on and off it”. The team showed great spirit by supporting their colleagues from Dubai in their games, with some wonderful fellowship developed among the two FCB teams. Cifré said his favourite moment was “when I turned around and suddenly saw all our boys cheering on FCBEscola Dubai in their game to qualify for the final”.